Hooo, boy. It's been a while since I did one of these. 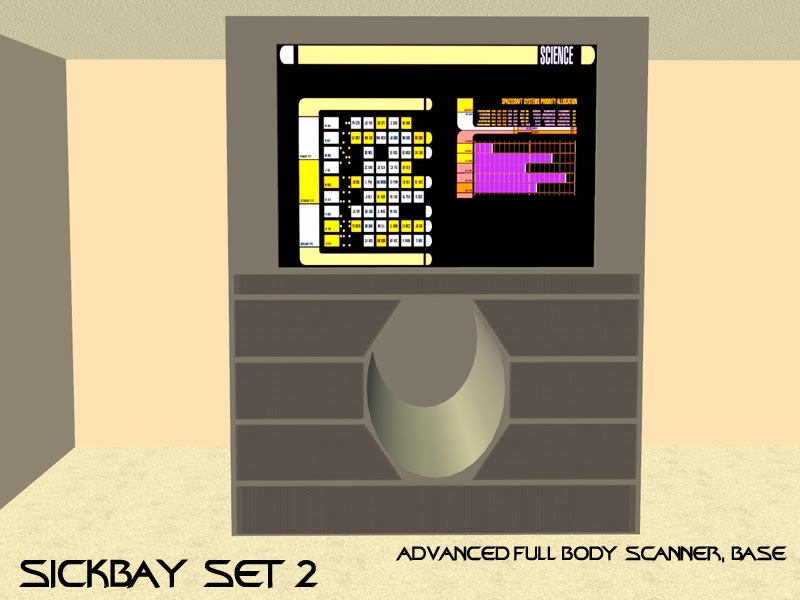 I meant to release the second sickbay set for a while but it got stuck in development hell. Anyway, I picked up where I left off and I've been working on it again for about the last month. As always, I have spent massive amounts of time playtesting this set. I tested each object individually, and hammered out all the kinks. As far as I've seen, there are no glitches and everything works exactly as it should as far as slave textures, joint alignment, placement, etc. Please feel free to report any issues. A few notes about the project: Series 4 is a bit of a misnomer. 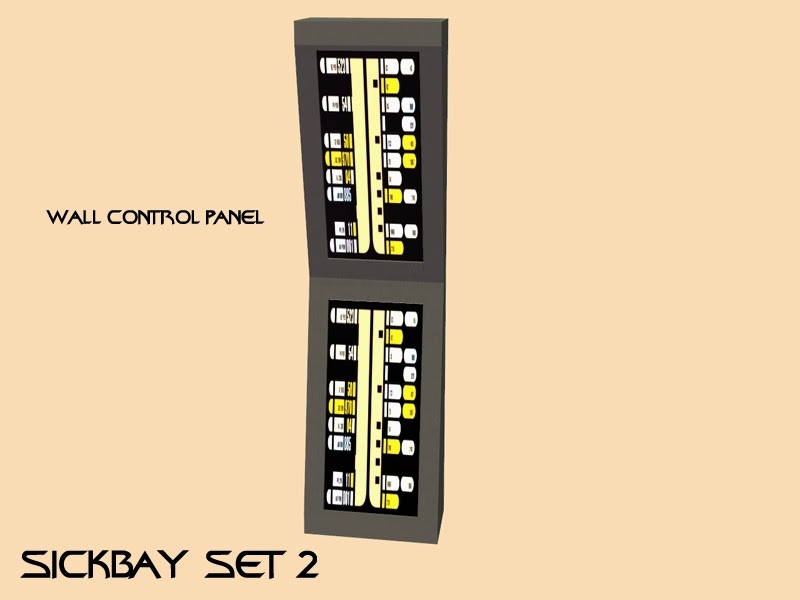 Prior to this set, I've only made two other modular furniture sets. 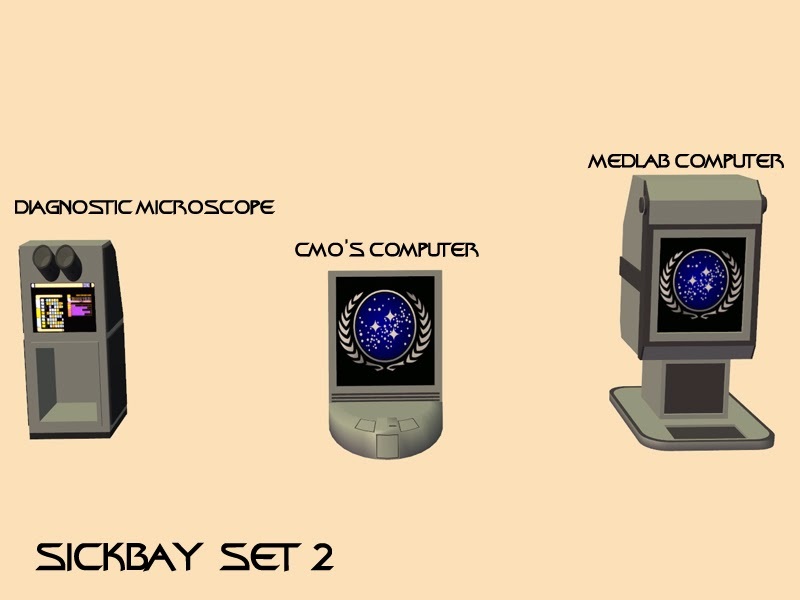 But as it complements the Cargo Bay Series 4 set, it seemed incongruent to name it Series 3. Unless otherwise noted, objects are base-game (See more specific descriptions below). 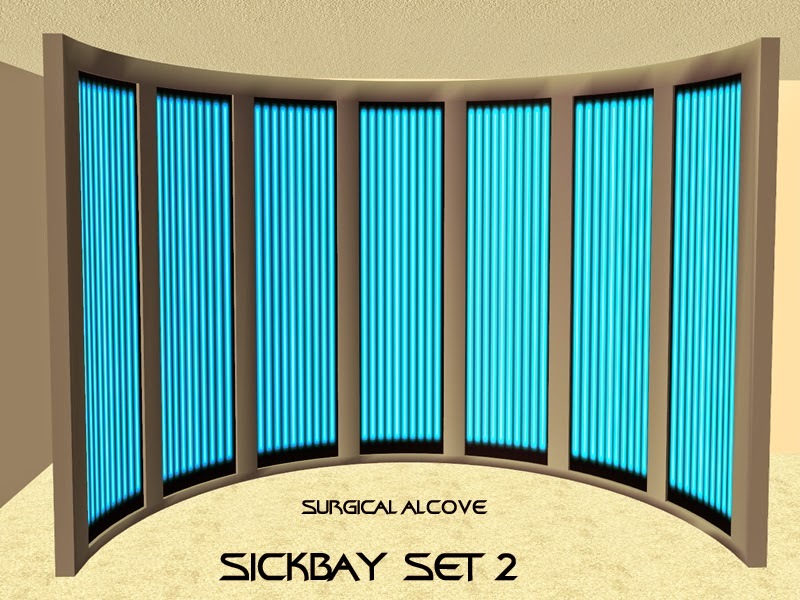 The focus of this set is to create unique sets as well as useful objects for sickbays and infirmaries. 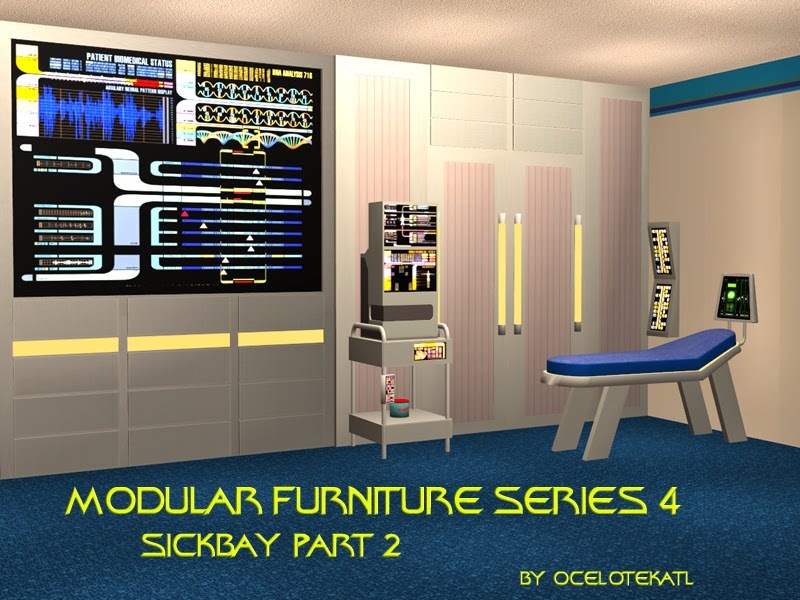 The furniture is designed to be stacked together, giving your sickbays a built-in look, for more realistic sets and backdrops.This set can be mixed and matched with any other sets from Modular Furniture Series 4. As I am more of a storyteller/ dollhouser than an actual player, my main focus was on how good the objects look in-game, but they have been thoroughly playtested and work well for players who focus on gameplay, too. 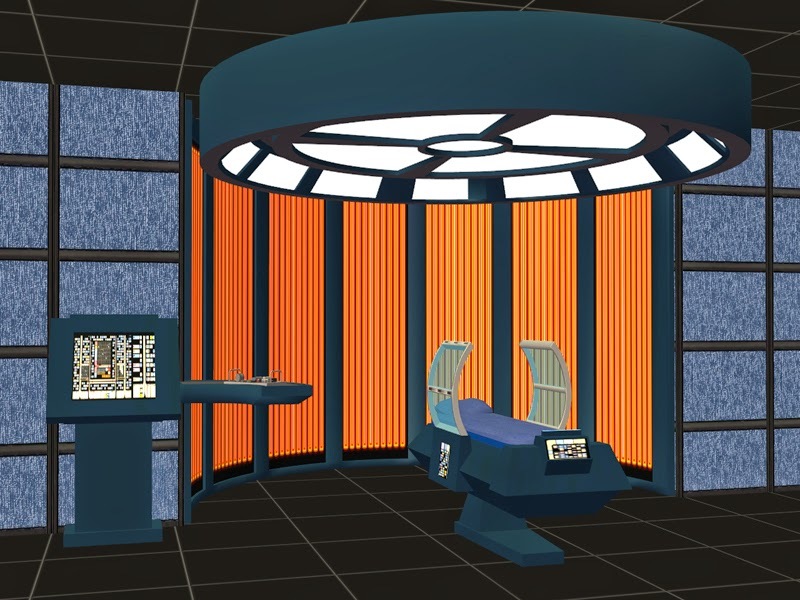 Please read carefully: The single bed and utility chair from the crew quarters set and the consoles and display panels from Bridge Set 1 provide some of the master textures for this set. As the repository technique is used, I have included the repository objects so you don't get flashing blue textures in your game. To keep the size of the file reasonable, THE RECOLORS FOR THESE THREE OBJECTS AREN'T INCLUDED. They can be downloaded from the RECOLORS THREAD. Note: all files have been Compressorized. A functional end table, great for putting medical equipment or surgical monitors on. There's a deco slot on the bottom shelf. 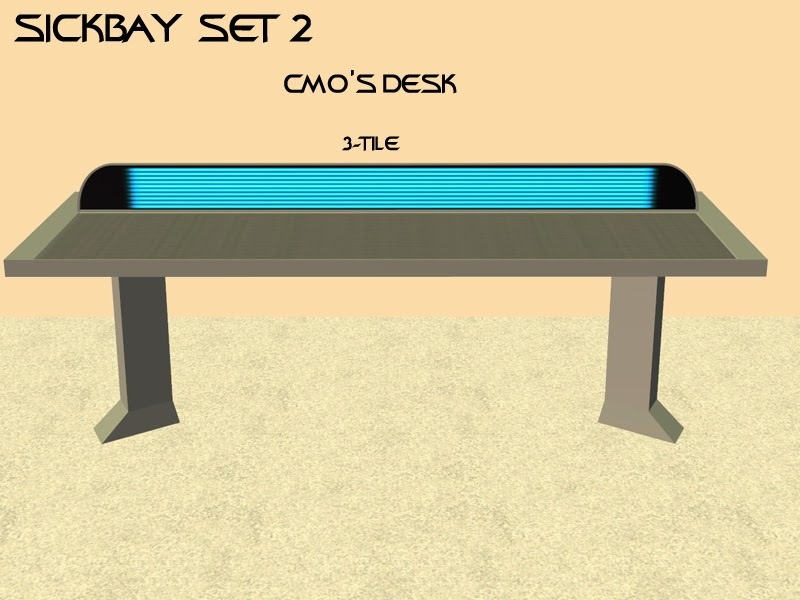 A set of modular tables for your medlab. They stack together, so they can fit virtually any space. Egghead stuff: They're tables. Nothing special. 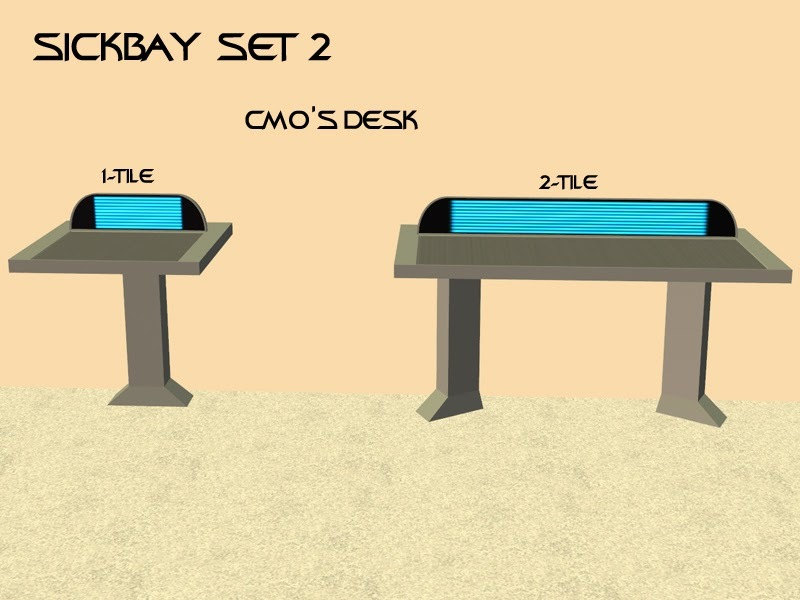 A desk fit for your chief medical officer, in various lengths. 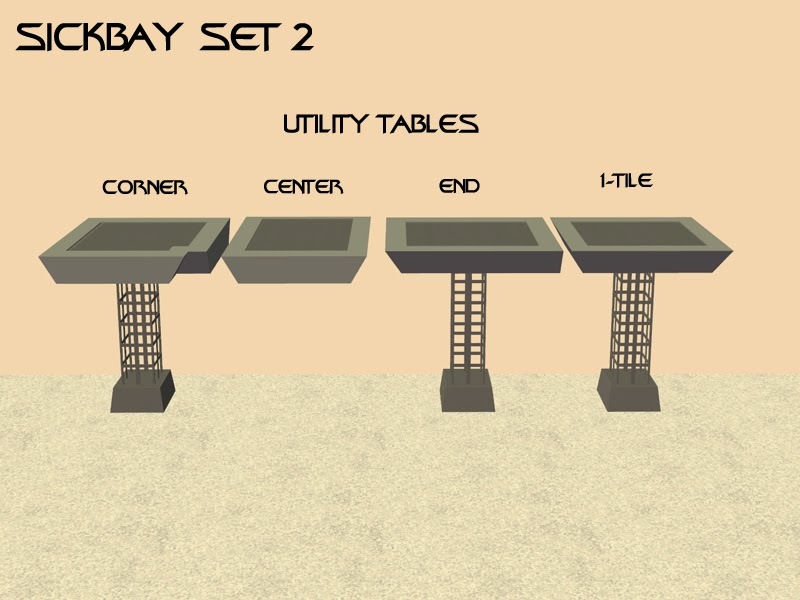 Egghead stuff: They're tables, yo. A 3-tile deco console. It's designed to be flush with walls. Egghead stuff: It's a deco object. 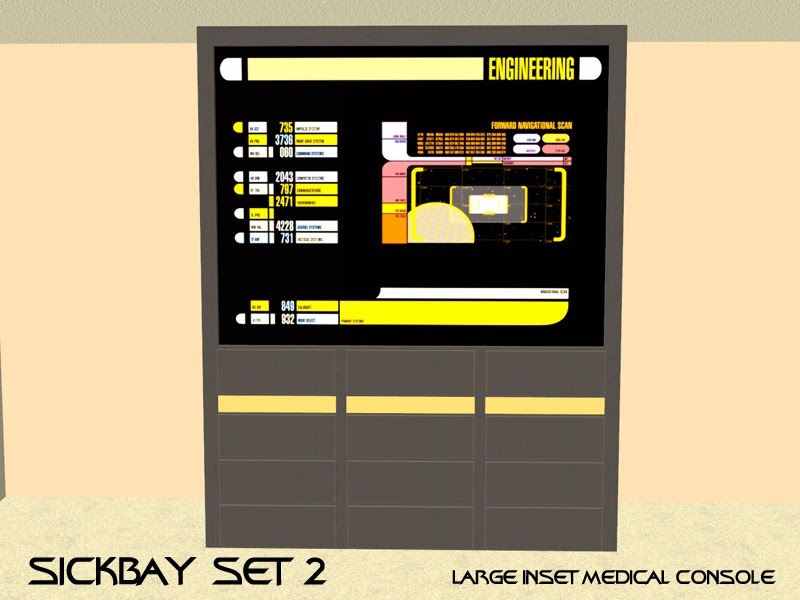 A big standing medical console. It builds logic skilling and generates science enthusiasm. Either (or both!) sidebar can be added to it for a distinct look. Egghead stuff: The console builds logic skilling. 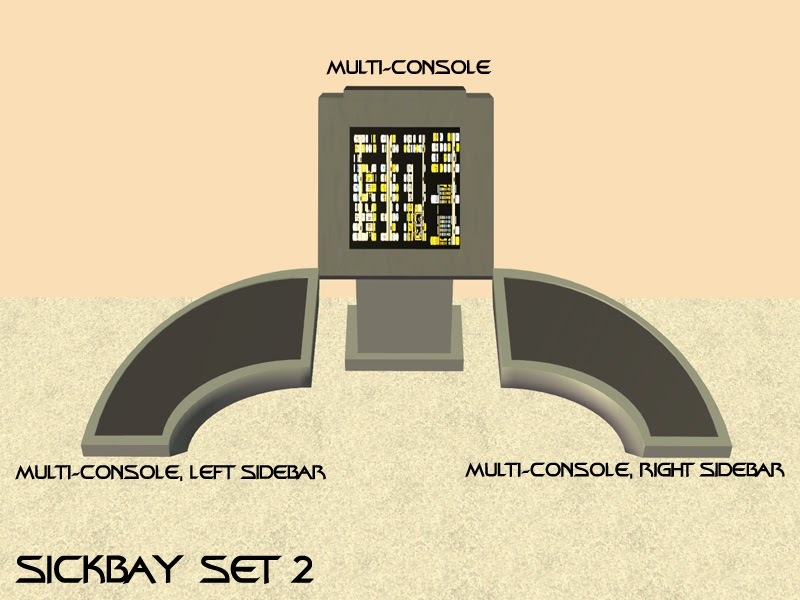 The sidebars each have 3 extra deco slots, for placing multiple objects. Two skill-building monitors. 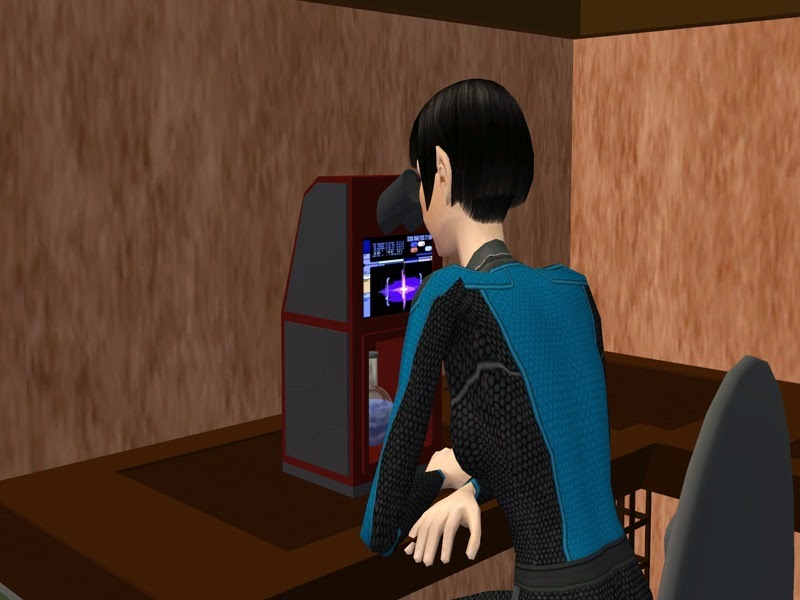 The scrolling monitor has a unique effect and comes with 12 recolors for the screen. Egghead stuff: The monitors build logic and cleaning skils. The scrolling monitor has an animated texture. Egghead stuff: The microscope builds logic. It includes a deco slot. It works like a standard computer. 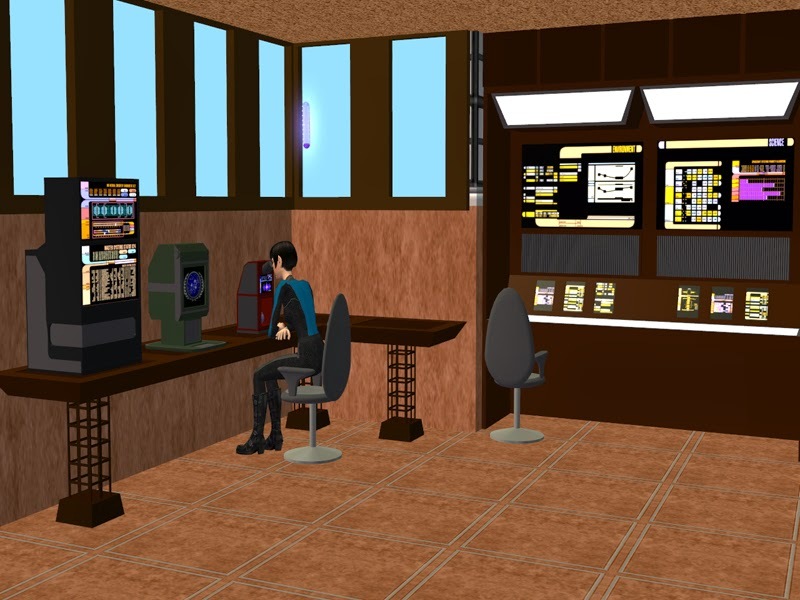 Modeled after the TNG desk computers. Egghead stuff: It's a computer. It works like a standard computer. 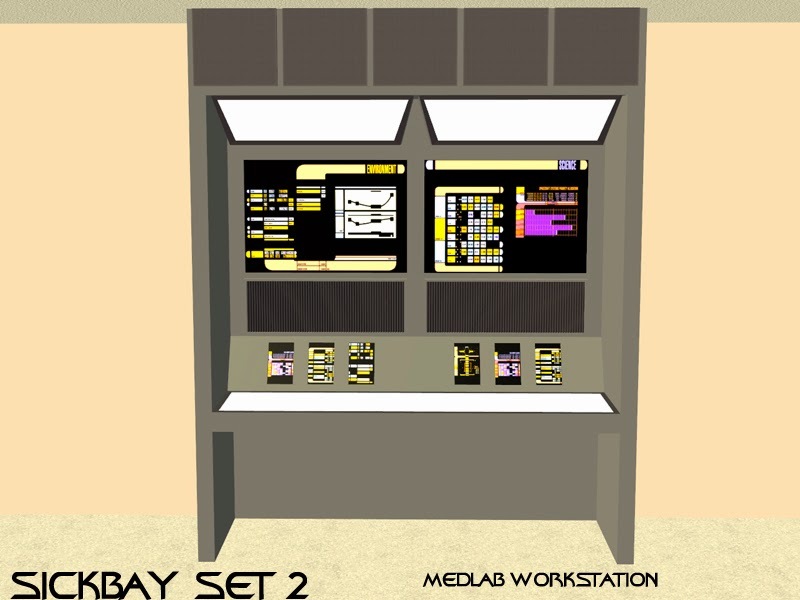 This one is modeled after the TNG medlab computer. Deco objects and a table. 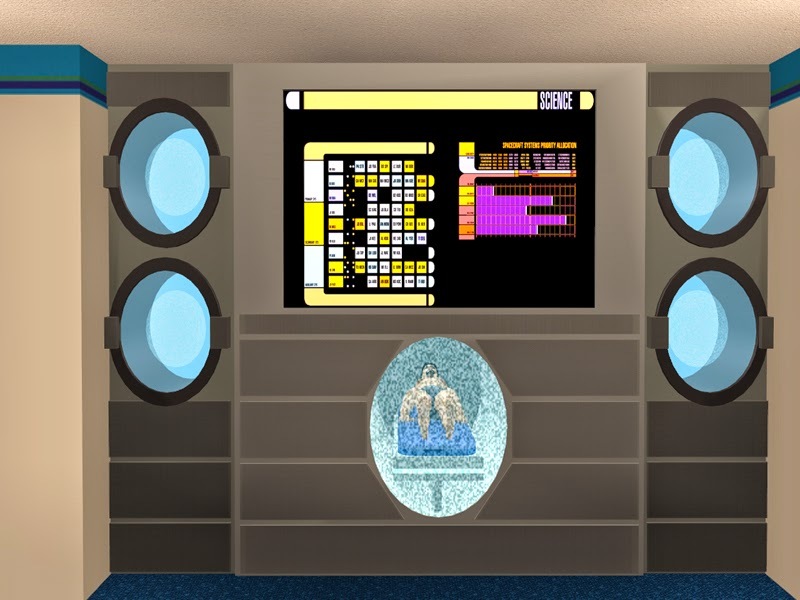 Modeled after the wall panel in Sickbay (TNG) and the stand of chemicals of no aparent purpose. Egghead stuff: The wall panels are a 2-tile wall object. 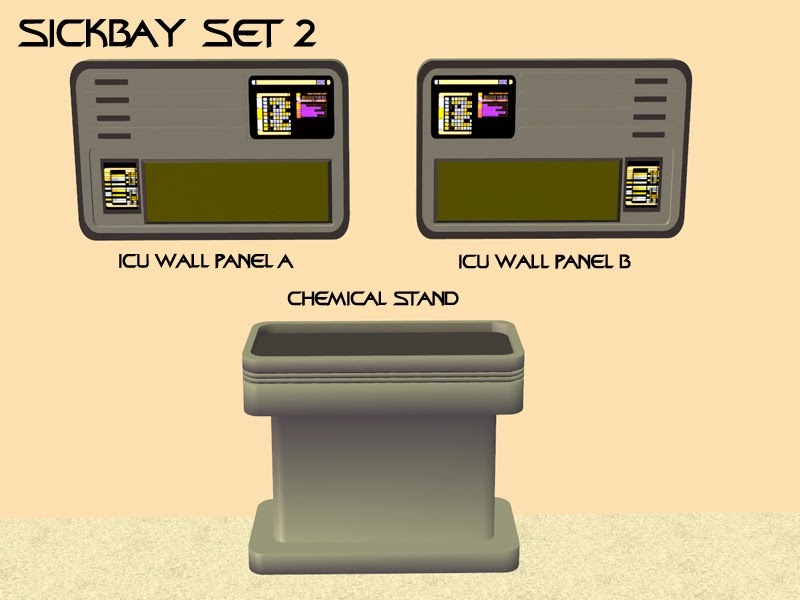 The chemical stand is a surface and has five deco slots. 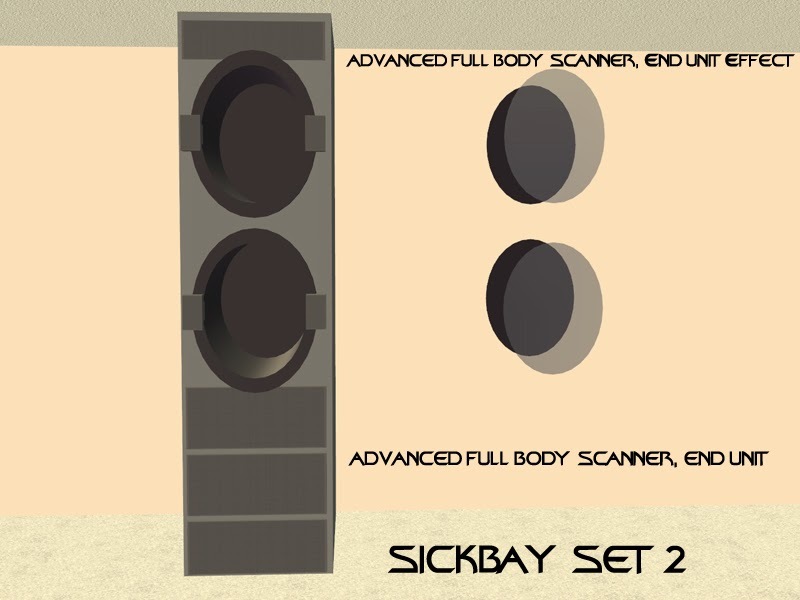 A simple deco object for your sickbay. 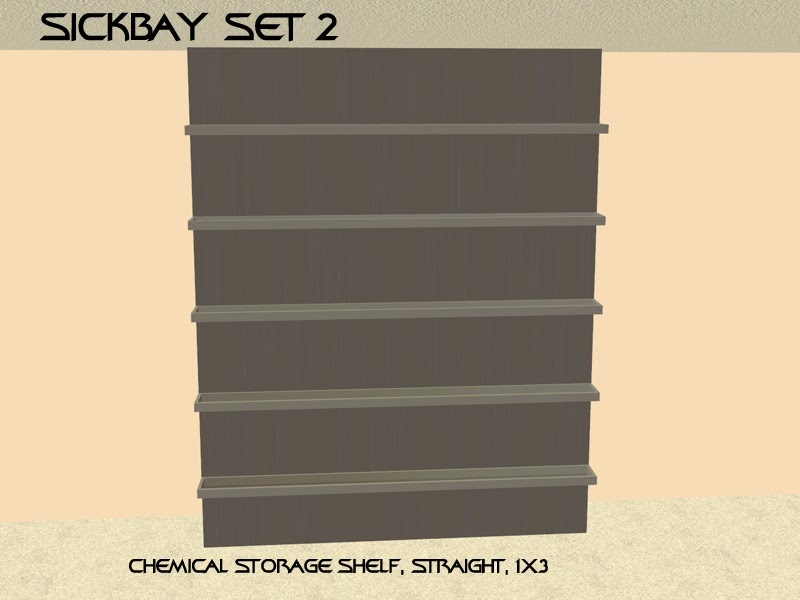 An assortment of shelves with lots of slots, for your medlab, plus a variety of recolors for the shelf. 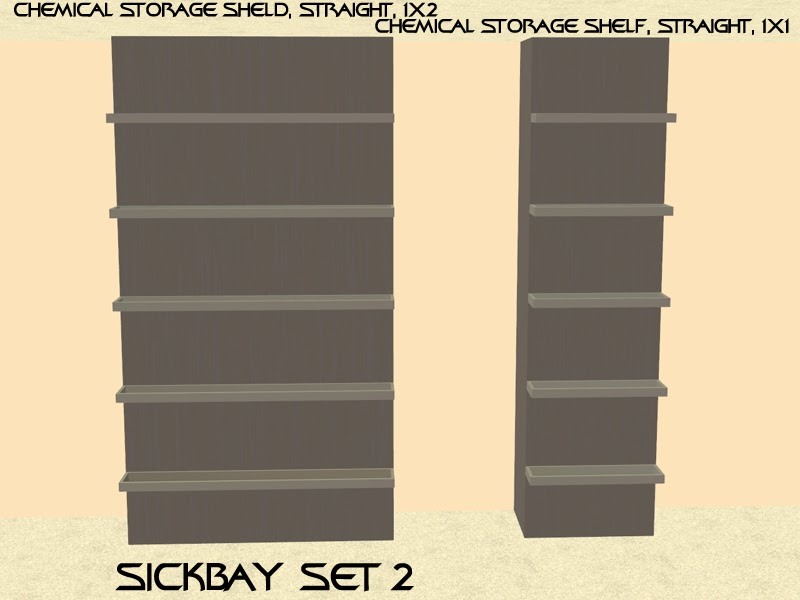 Egghead stuff: Each shelf has 15 deco slots/tile (15 for 1x1, 30 for 1x2, 45 for 3-tile shelves, and 75!!! for the 3x2 shelf). 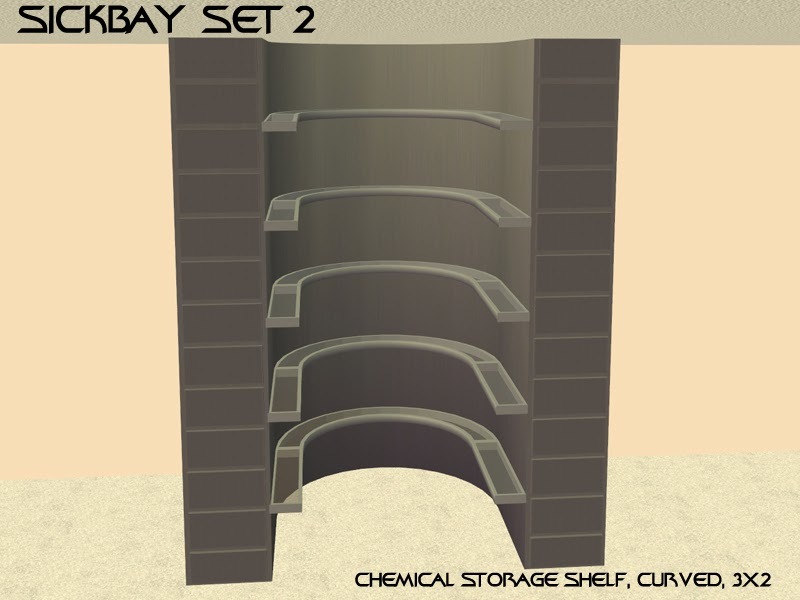 The 3x1 curved shelf is the master object for the shelf panel material. 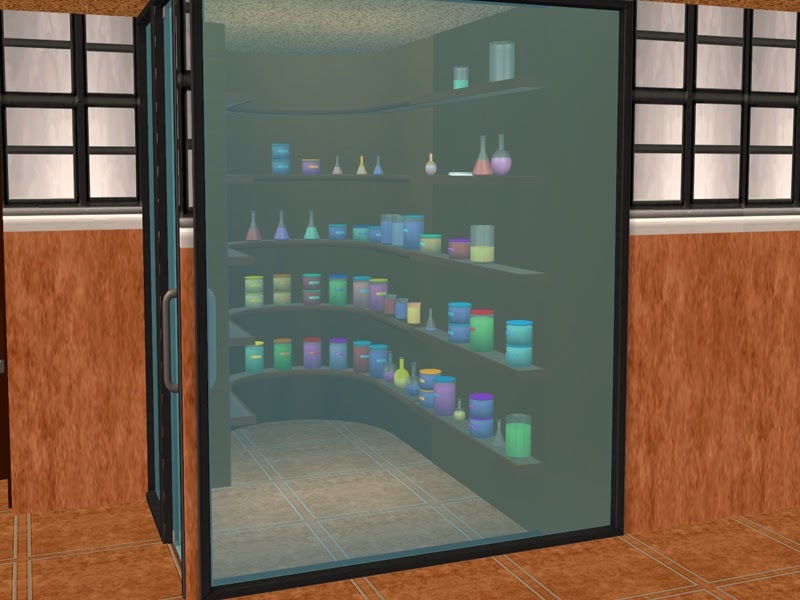 It's a refrigerator for your medlab. Egghead stuff: The refrigerator has 12 deco slots. 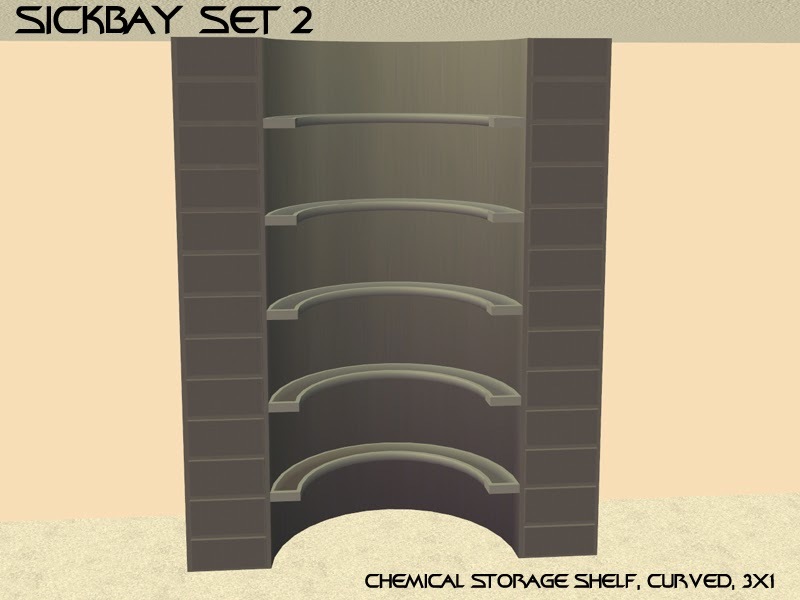 The shelf panel material is slaved to the 3x1 storage shelf. 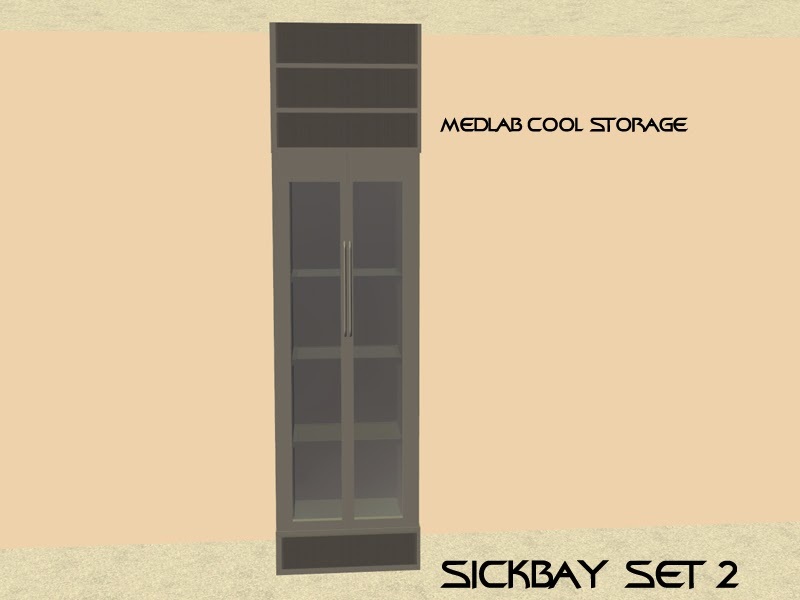 A cool work area for your medlab. Egghead stuff: It works like a standard 1x3 table. the base or all the way inside. Both of these objects have selectable special effects. 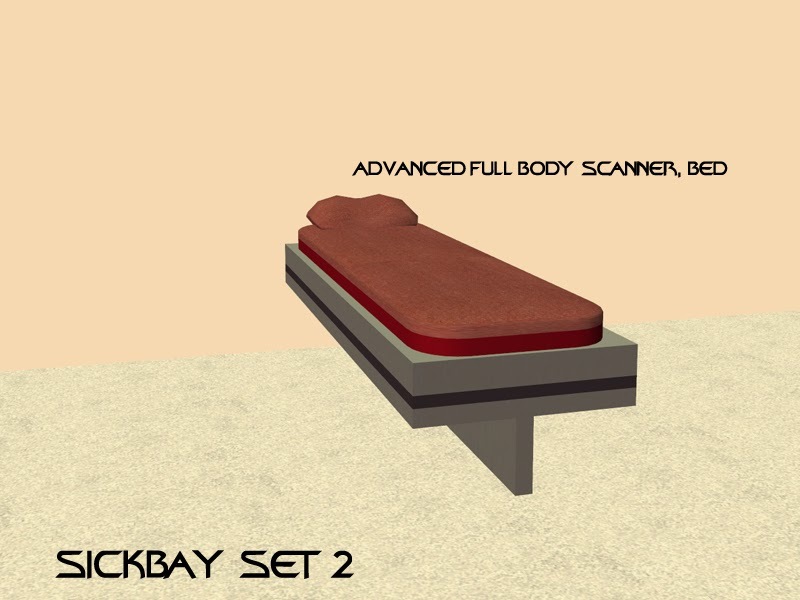 A sim can be posed on the bed using the Biobed B posegroup from the Biobed posebox. 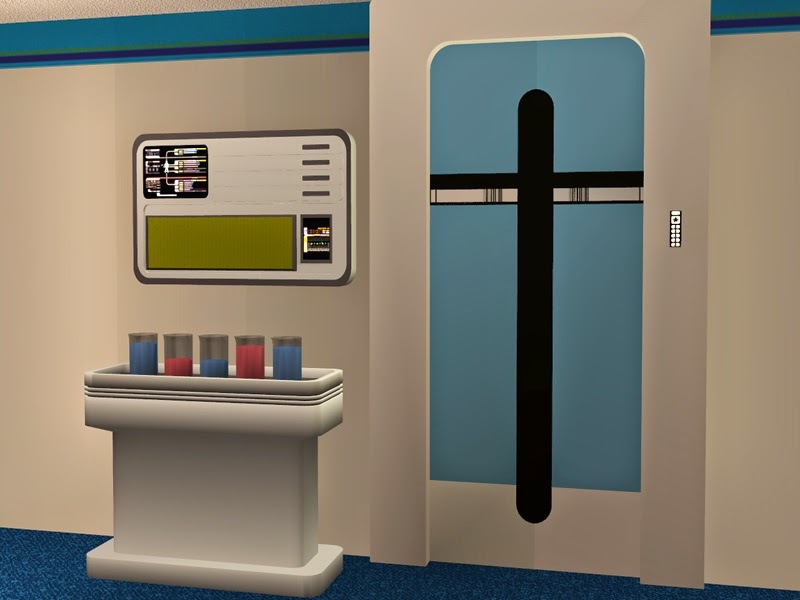 Egghead stuff: The sim can select one of for special effects (change material calls on energy feild and lighting) by clicking on the bed or the end unit glass. 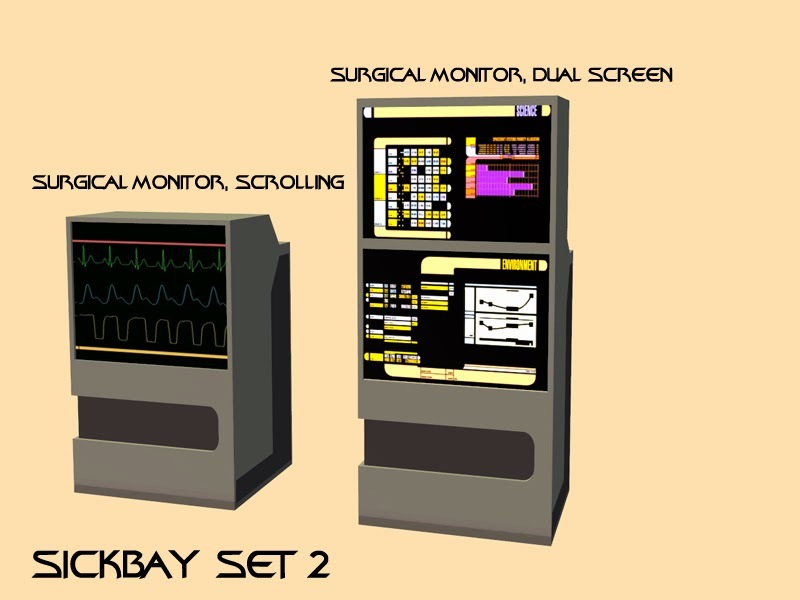 A set design based on VOY's sickbay surgery unit. Egghead stuff: These are deco objects. 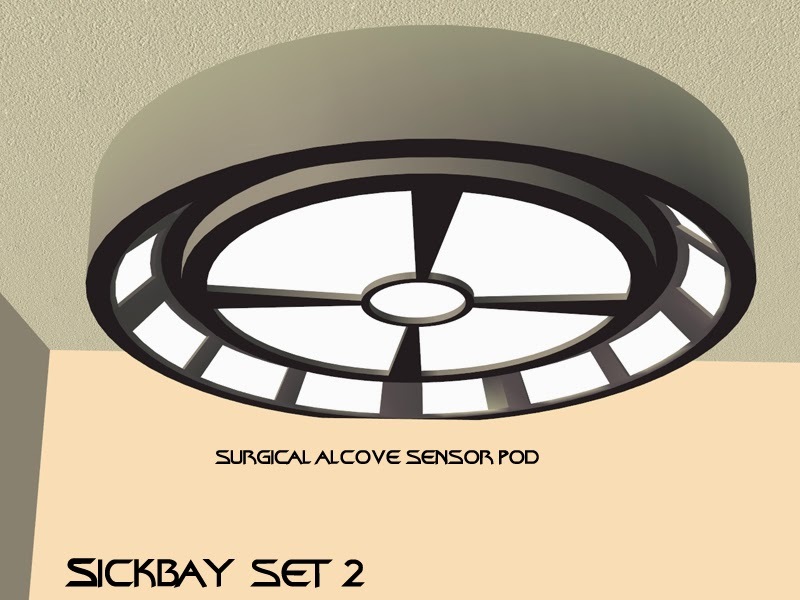 The sensor pod can be placed anywhere. Here are the downloads. I've included a collection file for ease in locating the objects. My pleasure. 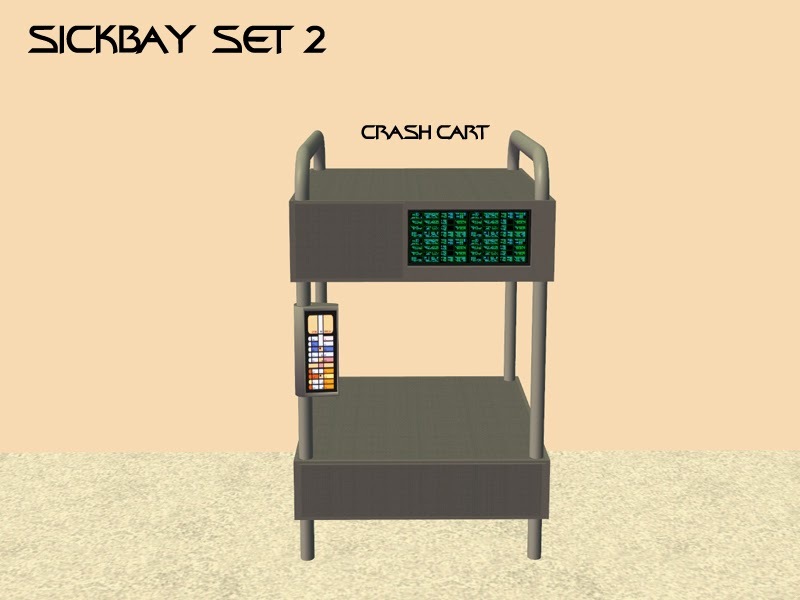 Thanks for the feedback, and I hope you enjoy the furniture set. Slots, Slots, SLOTS! Thank you! Plus all the skill building objects! Thank you for making items functional! Yeah! These were a headache to engineer, and they're a bit time consuming to load up with all the wee bottles, but they look awesome. And the skilling objects? I'd like to take the credit, but the original creators were Dr. Pixel and katy86. I just hammered the BHAVs about until they worked the way I wanted them to.